When President Trump was elected, there was a wave of optimism surrounding the prospects for the economy. Meaningful tax reform and a trillion dollars of infrastructure and policies to boost American jobs were all being proposed with proponents arguing they would lead to a step change in US growth. The dollar had a boost, equities surged, and interest rate hike expectations crept higher. President Trump and his Administration have since struggled to get momentum behind their policy initiatives, but it doesn’t appear to have cost the economy too much. Second-quarter GDP expanded 3% at an annualised rate, and recent data flow suggests we could see something similar again for the third quarter, despite the apparent impact from Hurricanes Harvey and Irma. Last Friday’s retail sales report posted robust growth while the jobs story remains strong and Tuesday’s industrial production report should add to the positives. Industrial output fell 0.9% in August while manufacturing output fell 0.3%. Hurricane Harvey resulted in wide-scale outages in the oil and gas sector and at other plants (petroleum and coal products fell 1.6%MoM, chemicals fell 2.2% while utility output declined 5.5%). 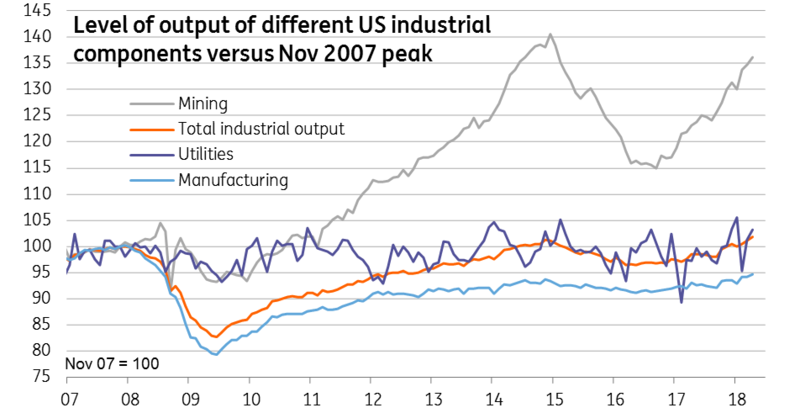 In total, the Federal Reserve estimated it took off 0.75 percentage points from both manufacturing and industrial output. So should we be looking for a strong rebound in September? Well, it's difficult to say. The Fed has admitted it has been tricky to get information both on the timing of resumption of operations at affected plants and which plants are still closed due to damage. There is also the problem that Hurricane Irma made landfall in Florida around the time of the data collection period for this September report so there may well be some ongoing weakness – the Fed noted that Irma was “anticipated to hold down IP”. Hence it's not surprising to see such a broad range of analysts’ predictions, ranging anywhere from +1.5%MoM to -2.0% with the consensus at 0.3%. We see upside risks to the 0.3% figure. For one thing, manufacturing employment wasn’t severely impacted by the storms, falling just 1,000 in September versus the 33,000 for non-farm payrolls, while manufacturing hours worked in the month were unchanged. At the same time, the ISM manufacturing index has hit a 13-year-high as a strong domestic economy, a competitive dollar exchange rate and strengthening global demand help to lift orders and production. Then there was the comment in the minutes of the last FOMC meeting where it stated “anecdotal reports from the hurricane-affected regions… indicated that production had already started to recover.” Add in a likely rebound from utilities, and we look for IP to expand 0.6% on the month. We think the outlook for the rest of the year is very positive as well. Order books are in strong shape while rising oil prices are encouraging more output from that sector – note that the Baker Hughes crude oil rig count in the US has grown 42% since the start of the year. Business surveys also paint a very positive picture. If President Trump can make meaningful tax reform, for example regarding a one-off tax cut that will allow a repatriation of foreign earnings, this should encourage domestic investment and industrial activity. Such an outcome is likely to add to calls for the Fed to tighten monetary policy more swiftly than financial markets are currently pricing.